Lawrence "Larry" Montgomery Burns is the long-lost son of Mr. Burns and a subsequent friend of Homer Simpson. Larry is the grandson of Mimsy Bancroft, Clifford Burns and Daphne Burns. He was born in 1940 and grew up in an orphanage before getting a job at a souvenir stand. He tracked down his father Charles Montgomery Burns and ended up getting a job at the Springfield Nuclear Power Plant. His uncoth manner, lack of intelligence and love of drink mean he has many things in common with Homer Simpson, and they become good friends, but anger Mr. Burns. Burns disowns him, for the second time and he returns home, realising he had not told his wife and children where he was for a week. He may have moved to Springfield as he was seen there a few times, notably in line at the unemployment office. He attended a rock concert at the Civic Center. 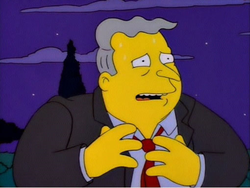 Larry Burns was voiced by and based on stand-up comedian Rodney Dangerfield. 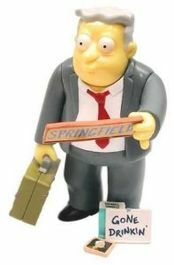 In the episode Bart Gets a "Z", a Rodney Dangerfield-style figure appears in a film with a plot similar to Dangerfield's 1986 college-comedy Back to School. This figure shares some characteristics with Larry Burns. The quasi-Dangerfield figure is voiced by Hank Azaria. Larry received an action figure in World of Springfield: Series 11. Episode – "Burns, Baby Burns"
↑ "How I Spent My Strummer Vacation"
Modified on July 4, 2018, at 05:56.